Abducted is an episodic sci-fi/horror adventure game released by Sunside Games – the makers of Crow, also on the iOS platform. In it, you play a human named Eve, who has been abducted by aliens and awakes to unfamiliar surroundings. In fact, she doesn’t recognise anything because she doesn’t remember anything. Communicating with a virtual intelligence on her arm device, she must unravel the mysteries of who she is, this ship she finds herself on and how she can possibly escape. So, will Episode 1 seize your time? Read on to find out. As mentioned above, you wake up with no recollection of who, what, where and why. Before you shut off at the thought of another amnesiac device, let me just state that the story is the biggest (maybe even sole) redeeming component of the whole experience. Eve has a device attached to her arm, used as a path of communication by what appears to be an A.I. She can converse with this A.I. via text responses, of which there are up to three choices at any given time. These branching conversations provide context and unveil more details about the world. “Change Conversation” can be selected to start the dialogue tree from scratch if you want to squeeze absolutely every bit of information out of “the Arm”. Well written, the dialogue merely hints at the resolutions to the bigger questions whilst creating new ones. This might sound frustrating taken at face value, but it’s done correctly here, giving you just enough data to be sated. 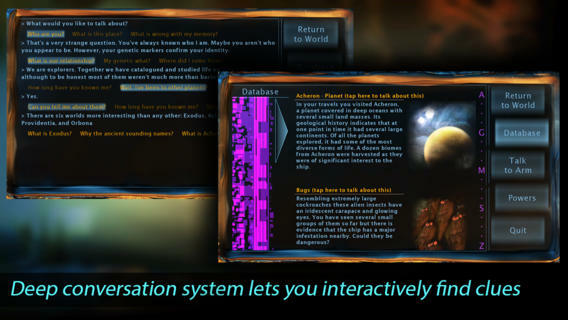 Abducted features a skill tree, although in Episode 1, it is all but pointless and unnecessary. With every aforementioned parcel of knowledge you gain from ‘the arm’, skill points are acquired. Navigating every inch of the significantly linear landscape also offers skill points; points of interest glow, and accessing them adds to your database as well, which can be read through at any time via ‘the arm’ (further conversations can even be triggered by looking up an entry in the database first). Movement is governed by point-and-click conventions, but Eve likes to interpret the ordinarily 2D method of navigation in her 3D environment in unintuitive ways, taking a longer route or moving in the wrong direction. If you’re impatient and tap again while she is already in motion, it seems to confuse her even more. Eve has two main powers at her disposal from rather early on: ‘Manipulate’ and ‘Pulse’. The former is used more-so as a puzzle mechanic with the latter being your go-to attack, although your encounters mostly comprise of running away from a particular pursuant, or avoiding aggressive tentacles. Otherwise, ‘Manipulate’ can be used to placate the tentacles, which act as the ship’s defensive systems. Lastly, there are terminals which represent the basic objective of each zone. They can be either solved or hacked. 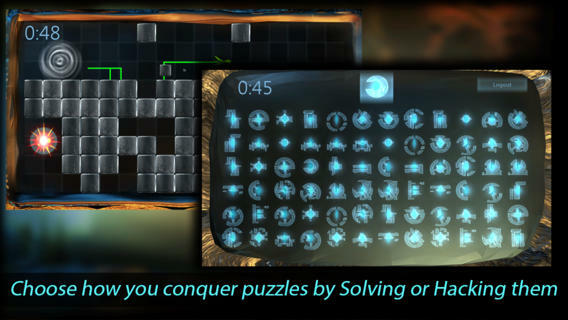 To solve them (as seen in the image below), you are required to identify a set of glyphs and find their match in a second batch. These glyphs are found in the immediate surroundings, and can be uncovered by blasting their hiding spots with ‘Pulse’. Hacking involves a classic Snake-like mini-game, where you control a line using a virtual d-pad, picking up glyphs on the way from point A to point B on a grid. Having two approaches to achieving the same goal is appreciated as a source of variety, yet it isn’t entirely necessary, and the difficulty levels of both are always manageable – easy in fact. The developers laud their in-house Radiance engine for being able to render volumetric fog, dynamic lighting and shadows with great effect, but the game sometimes tends to look like a game design course experiment in Unity. There is a distinct lack of detail that would become even more apparent if the game wasn’t strategically bathed in darkness. And when there are heavily lit areas, it’s almost as if “high bloom” is the only way the slider moves. Environmental object meshes are blocky and just adequately textured, and certain animations are decidedly rigid. The music is appropriately atmospheric and eerie in parts, although the sound effects are of a painfully stock quality. Eve has to have the most ear-piercing, aggravatingly bad screams and groans ever heard. 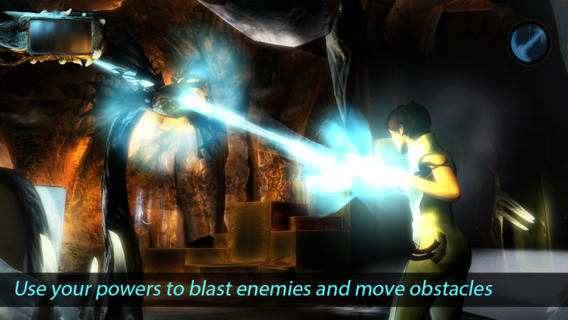 Abducted looks and plays, to an extent, like a high-end prototype, not a finished product. The animations are stiff, the environments are poorly textured, the timing and chase elements are half-baked and Eve likes to take the most difficult path (or just plain walks the opposite direction) to get to a destination. But – and this is a big but – the dialogue is well-written and the story is intriguing enough that I want to learn more. If you take the time to explore the environment and engage in “the Arm’s” speech-tree, your curiosity will surely be piqued. Episode 1 creates more questions than answers, but in the least frustrating way possible. Hopefully the game develops some more depth in Episode 2, as Sunrise really need to polish the gameplay experience to match up to the potential of the plot.